Egg-Free Baking – which egg alternative is the best substitute for cake recipes? 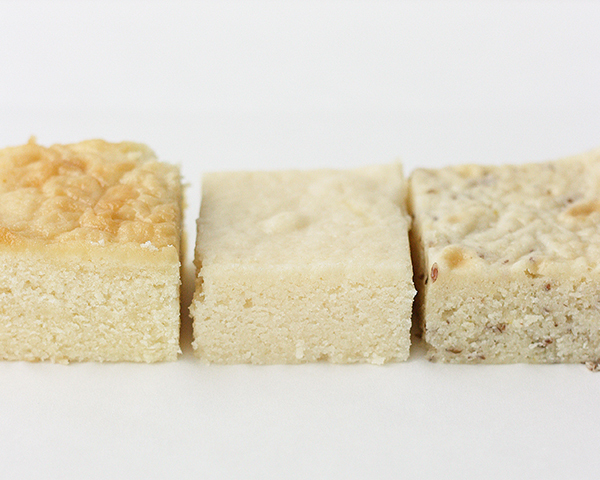 A new baking science experiment by our contributor, Summer Stone-Polzel. 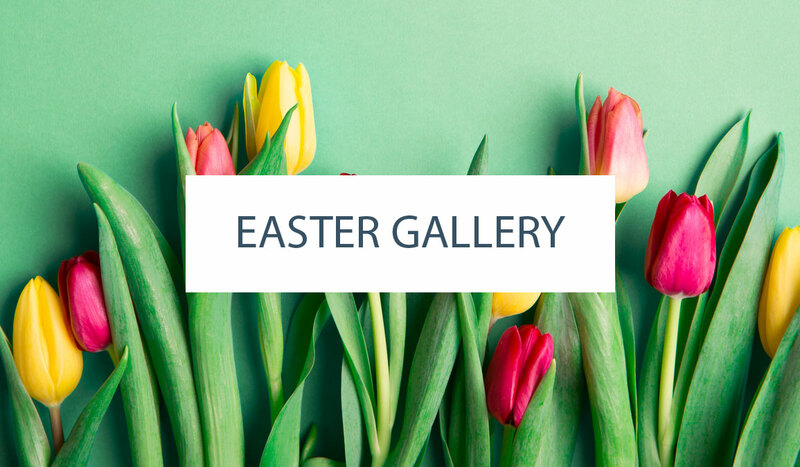 People choose to make egg-free baked goods for a number of reasons varying from allergic reactivity to dietary necessity to moral conscientiousness. 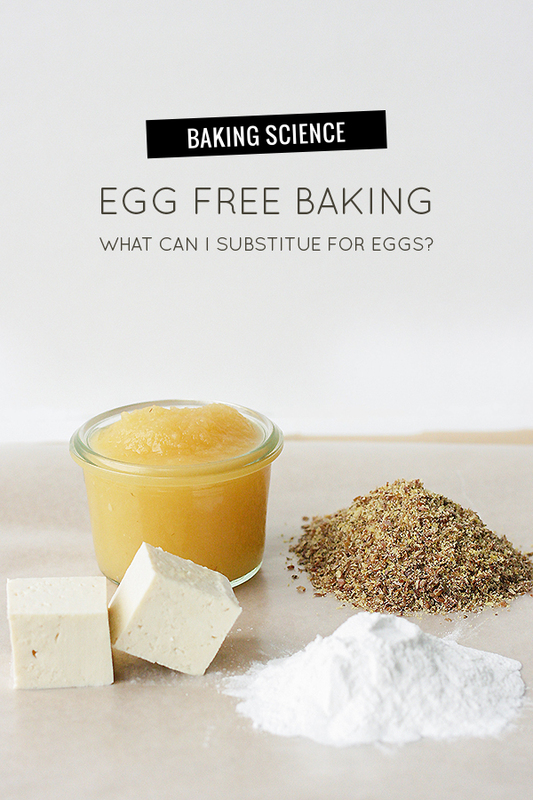 Whatever the reason, many people opt to bake eggless for themselves and others. There are a number of options for egg substitution that are available but which one works best, if at all? 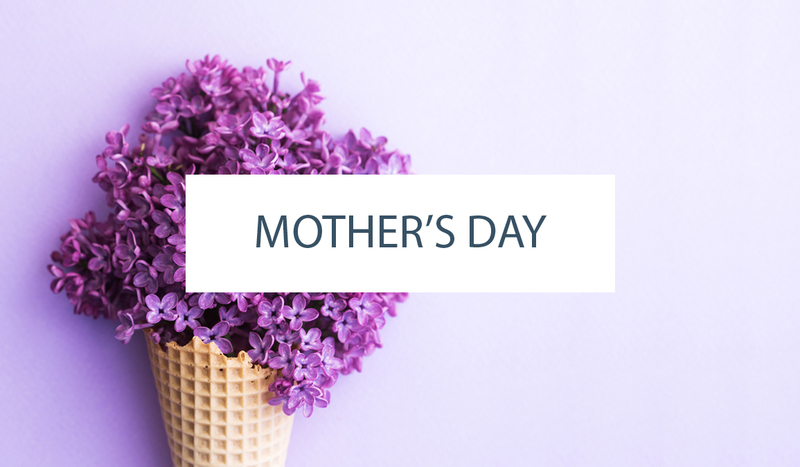 Here I will cover the best ways to make a cake that is egg-free and delicious. Most viable egg-substitutes aim to fill one or more of the roles that eggs perform. In order to find the best replacement for eggs in a cake, I tested numerous candidates in a standard cake recipe. What quickly became evident was that it was difficult to come up with a direct substitute and that recipe mediation was necessary to create a tall, light cake. Determined to find a solution, I started working backwards from an established egg-free recipe and studied the changes that made the recipe work. This eggless recipe included an extra cup of flour and an extra cup of liquid than that found in a standard vanilla cake recipe (which usually contains 1 cup butter, 2 cups sugar, 3 cups flour and 4 eggs). This additional flour-liquid mix acts like a paste that binds the elements in the cake and fills in the structural role that eggs typically take on. An egg replacement was also added to fulfill some of the other egg characteristics. From my initial experiments I chose the four most promising egg fill-ins to test the improved egg-free recipe. I tested each of the experimental ingredients head to head against egg to determine which one performed best. 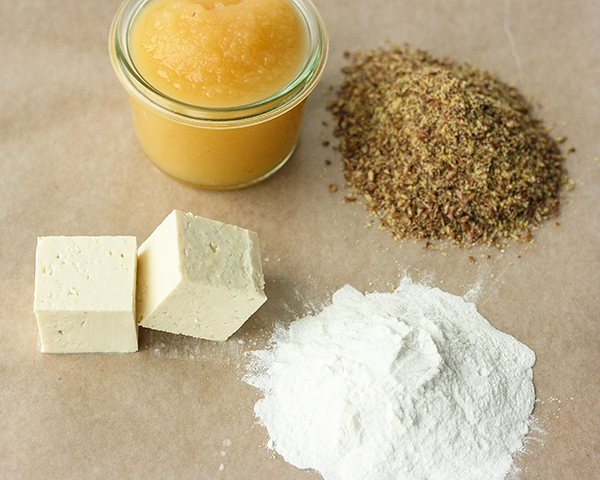 The egg substitutes that I used included applesauce, flaxseed meal, tofu and Ener-G brand Egg Replacer. In the end, I found that nothing acts quite like eggs do but there are some products that do much of the work of eggs. None of the substitutes were as good at browning as eggs are because they lack the proteins necessary to carry out Maillard reactions and none could quite mimic the flavor or structure that eggs provide – but some provided nice flavor of their own. Here is a list of egg ingredient substitutes from best to worst and how they fill in for eggs. 1. Flaxseed Meal (use 1 tablespoon with 3 tablespoons water for each egg): This soluble-fiber rich seed thickens and stabilizes emulsions in a cake batter. The fiber also holds on to the added water for effective moisture. This was my favorite substitute. 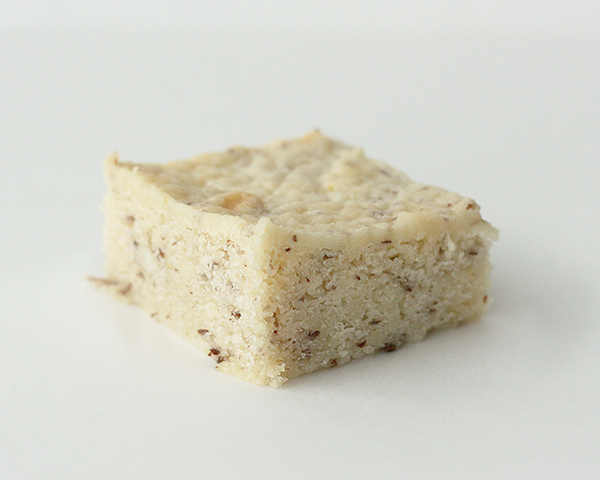 The flaxseed added a mild, pleasant wheaty flavor while providing for a moderately light cake. The downfall of flaxseed is that is creates brown flecks in a cake. In a chocolate or spice cake this may not be an issue but if you are making a vanilla cake the flaxseed is quite obvious. 2. Ener-G Egg Replacer (use 1 ½ teaspoons egg-replacer with 2 tablespoons water for each egg): This commercial product combines starches, leavening agents and soluble fibers to act like eggs. The starches add structure, the leavening lift and the soluble fibers stabilize emulsions and hold moisture. This product was a close second to flax meal and had a structure that was most like the egg-containing cake. The trouble with the egg replacer was the paper-like after taste caused by tapioca starch. If used in small amounts in a frosted cake this may be minimally noticeable but the naked cake tasted distinctly of it. 3. Tofu (use ¼ cup of silken tofu for each egg): In theory, the soy protein in tofu could provide some binding properties but in actuality moisture seemed to be the primary contribution. This cake was shorter and denser than the flax or Ener-G cakes and tasted faintly of tofu. 4. Applesauce (use ¼ cup for each egg): This cooked fruit puree is a good source of moisture and contains pectin which stabilizes the cake structure. Unfortunately it also leads to a short, gummy cake that clearly tastes of applesauce. Applesauce flavor is great if that is what you are going for but in a basic vanilla cake it seems out of place. Egg-free cakes benefit from a mix of additional flour and liquid which helps with binding and structure. In addition to this, egg replacers can help take on some of egg’s jobs creating a nice baked product. 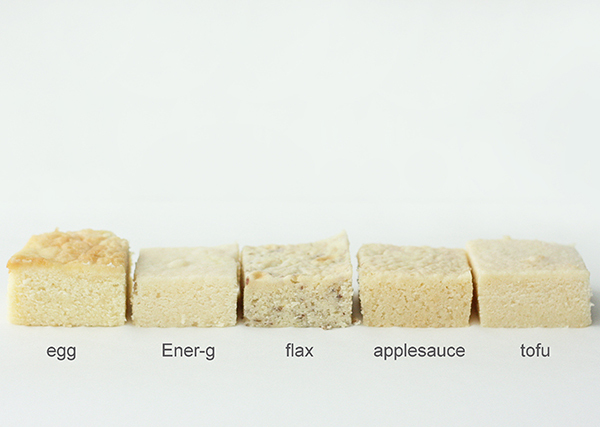 Flaxseed meal is a tasty and reasonably effective egg stand-in if you don’t mind some brown flecks in your cake. For a visually pristine cake, Ener-G egg replacer may be a better option but you will sacrifice some flavor. Applesauce and tofu don’t do a great job filling-in for eggs but they aren’t awful if it is all you have on hand. 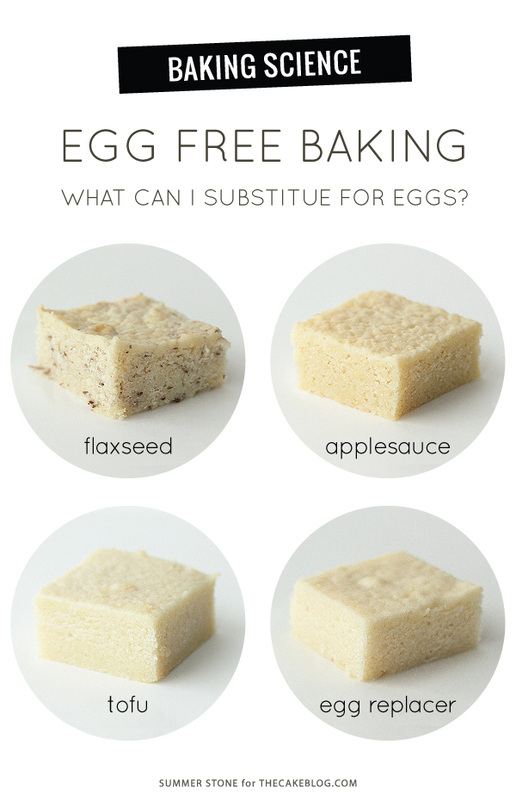 I hope this helps your egg-free baking efforts! Can You Overmix a Cake? I have found great success with using apple cider vinegar + non-dairy milk in recipes. It leads to light, fluffy and moist cakes. Check out “Vegan Cupcakes take over the World” recipes by Isa Chandra Moskowitz. I love that book and have used it extensively. The cider vinegar and non dairy milk make a great buttermilk substitute that helps add flavor that’s list when the eggs are left out. This is a great post. I have had limited success baking as a vegan and it is really nice to see the options laid out, side by side, nice job! Summer, I so enjoy your posts. The one you did on cake flour made me a firm believer in Bob’s Mill. I hadn’t even known they had a cake flour and had been paying shipping to get King Arthur! 25 years ago my 2 small children were then allergic to everything it seemed. Back then there was not available all of the gluten free and allergy free foods that are available today. Both of them will often comment on how much easier it would be for me to cook and bake for them. I always used flaxseed meal but I was usually using it with something odd like potato starch so the taste was already off. Flaxseed is amazing on how glutinous it gets. Hi Terrisue! I’m so glad you discovered Bob! His company and products are fabulous and if you visit the store/cafe here in Oregon he is often found seated chatting with customers just because he loves interacting with them. Thanks for the suggestion Jumana! I’m not sure how much it would have affected your results, but the tofu in your ingredient lineup photo is definitely firm tofu, rather than silken. Silken tofu shouldn’t be able to balance on a corner (it’s far too soft and wobbly) and should have no holes (i.e. Be completely smooth = silken). 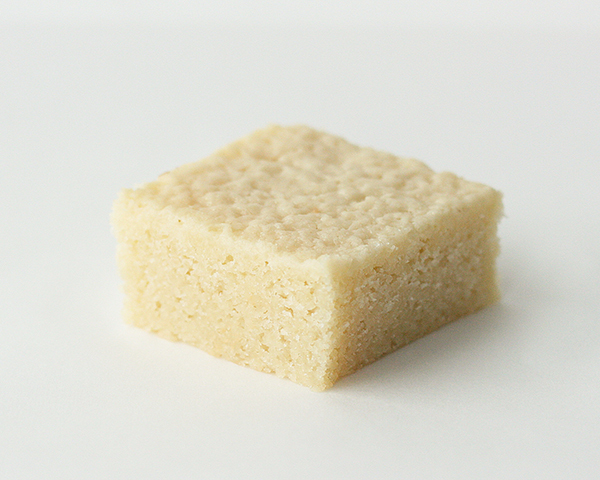 It also has a more mild, less “tofu” taste than the firm stuff, and has a creamy mouthfeel. I’d be interested to see how it would stand up to the other contenders in this test – I suspect better than the firm kind. Hi Rachel, Observant eye! 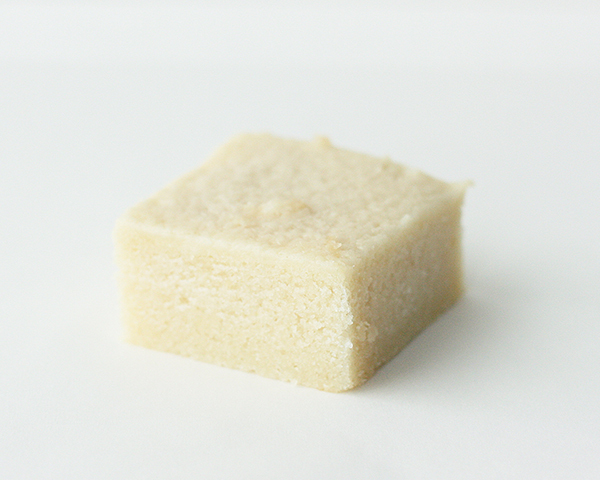 I did use silken tofu in this test, but it didn’t photograph very well so I photographed using a firm tofu. In the first round of tests I used the firm tofu because it was all I could find at the store I usually shop at but I tracked down some silken and for the second round of testing. The silken tofu was definitely easier to use! I didn’t have to puree it before adding it to the batter. I’ve used a chia “egg” to moderate success, but I’ve found it’s best in biscuits (cookies) and cakes that have nuts/fruit/choc chips or similar folded into the batter as they can add a slight crunch. It’s just 1tbsp of chia seeds mixed into 1/4 cup water and left to sit for about 5 minutes so they swell up and make the water sort of gelatinous. When I was asked to make a small vegan side wedding cake for a bride, I searched all over looking for recipes. Even though I’ve been a Pastry Chef for years, I’ve only done vegan desserts a couple of times and wasn’t too familiar with vegan cakes. I found that the cakes without a replacement tasted the best. I ended up making a chocolate cake that used almond milk and cider vinegar. It was very fluffy and soft without the egg to bind it, and that was really my only worry. It was just a small 5″ side cake for the bride and not part of the tiered cake. I would be concerned about it being stable enough for stacking though. I would love to know your opinion on the best egg-free ICING for making beautiful, smooth cakes/piping etc. My boyfriend can consume eggs when baked in things (like cakes) but a meringue-style icing would totally set off his allergies. Suggestions? How lovely to see the different cakes side by side! I’m not sure about US, but in Europe there’s golden flaxseed to be found (usually in organic food stores). I always use it for vegan cut-out cookies that I don’t want to look speckled and “healthy” (people seem to get suspicious around healthy-looking desserts). When it comes to eggs, one for one substitutions in cakes are obviously difficult due to eggs playing a different role in different recipes, so maybe adjusting (lessening) the quantities of flaxmeal and water (or aquafaba, perhaps?) would help, along with a bit more of a chemical leavener? Or maybe a combination with an extra spoon of cornstarch added to the flour? 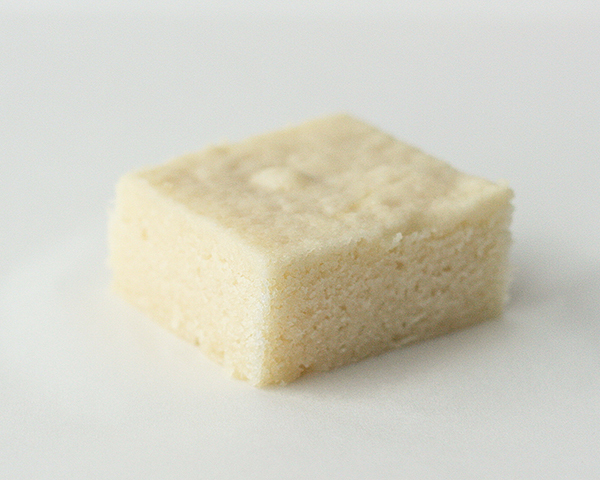 Besides adjusting amounts of flour and liquids, some bakers also seem to swear by adding boiling hot liquids when creating vegan sponge cakes; and swapping butter for oil might also be a possibility in achieving a cake that is lighter/less dense (especially when, say, silken tofu is used). On egg-free baking pages, condensed (coconut) milk seems to be all the rage when it comes to baking white cakes, while some seemed to have success using soy yogurts as well. Given so many variables in which the whole adds up to more than just a sum of its parts – with various ingredients and techniques in play -, the quest for a perfect egg-free cake might be starting with a “depression cake” of sorts and seeing how certain properties (rise, crumb, flavour, stackability etc.) could be further improved by tweaking it, rather than trying to find an universal egg replacer for just about any recipe (convenient as that would be). Baking with eggs has a long history, and there’s no doubt been lots of trial and error involved in development of today’s recipes, and while vegan baking has been developing at quite an impressive rate (and by using ingredients rather resourcefully), we still have some innovative work cut out for us. It is really nice. I think condense milk can work too. Thank you for this post. My son used to be severely allergic and I had to get creative with my baking. I used the Ener-G, ground flax seed and applesauce options to differing successes. Applesauce in brownies is a great way to go! My favorite substitute is really simple for 1 egg: 2 Tbsp water, 1 Tbsp oil and 2 tsp. baking powder. I doubled or tripled to great success! I have no idea if those ingredients work for vegan foods. We were dealing with a bad allergy and baking is my happy place so I had to find something to work for us! Thanks for the great article! I think “man about cake” may have a recipe….